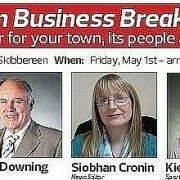 REMINDER that the Southern Star are hosting a Business Breakfast in the West Cork Hotel, Skibbereen on Friday, May 1st at 7:30 am. The Skibbereen & District Chamber of Commerce are delighted to be in partnership with the Southern Star for this event as they look on it as an excellent opportunity for business in the area to network and catch up. 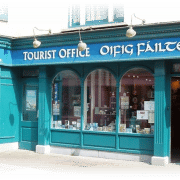 Following a successful season in Skibbereen last year, Fáilte Ireland are happy to work again in partnership with Skibbereen & District Chamber of Commerce so that the Tourist Office will be once again be open 7 days a week from June for the 2015 summer season. To facilitate the extended opening hours the office will be staffed by a combination of part-time staff and volunteers, with Fáilte Ireland training taking place over the coming week. Plans are still underway for the Town Hall building, which encompasses the Tourist Office, to be re-modelled toward the end of the year, however it is still hoped that the Office can be freshened up for the tourist season ahead. Keep an eye for more updates as they become available…….. 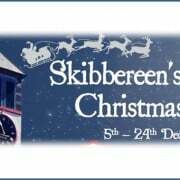 The 90 members of Skibbereen & District Chamber of Commerce are encouraging you to shop local and make Skibbereen your West Cork Christmas Shopping destination. 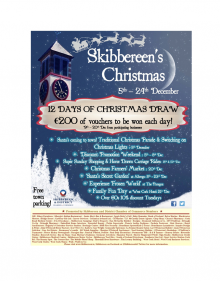 There is a focused campaign to promote shopping in Skibbereen during the festive season, which this year will culminate in a “12 Days of Christmas Draw” where €200 worth of vouchers will be drawn daily at 11am in the square between the 9th and 20th of December for the lucky winners. Festivities kick off on Friday 5th December with the annual Christmas Parade, which begins at 4:30pm from Ilen St and makes its way to the Square, where this year one lucky winner of a competition run in the local primary schools will have the unique opportunity to switch on the Christmas Town Lights. Back by popular demand is the convenience of Sunday Shopping in Skibbereen on both the 14th and 21st of December and new this year are Christmas Carriage Rides around town on these days between 2 and 6pm from the Bridge, where a new Crib Scene, thanks to the Community Employment Workers, will also be on display. The approach to the town is lit by Lights on Living Trees and the chamber would like to acknowledge the hard work undertaken by Mark McCarthy and Paul Daly to create this feature as well as the sterling efforts of Skibbereen Tidy Towns who continue to ensure that Skibbereen looks at its best particularly at this time of year. To keep the atmosphere in town as festive as possible we are also encouraging businesses and shoppers alike to don a hat for “Santa Hat Saturday” on 13th December. The excitement is already building for the festive season in Skibbereen as two exciting new ventures open in town on Friday December 5th – “Frozen World” at the Paragon and “Santa’s Secret Garden” l launches at the Eldon. Also returning to the West Cork Hotel on Sunday 21st December is the popular Family Funday Sunday which always proves to be a great hit with all the family. If you love a bargain, discount promotions will run in participating businesses over the weekend from the 5th to 8th December and on Saturday the 20th of December keep an eye out for Santa’s Elves who will be around town helping out where they can. Finally, don’t forget that the Over 60s 10% discount promotion continues every Tuesday and that Skibbereen offers free town parking too! Dr. Seán McCarthy, Hyperion Ltd will present at the upcoming Skibbereen & District Chamber of Commerce Breakfast Briefing on Tuesday next, 11th November in the West Cork Hotel, from 7.30 to 9am. The presentation, “European Funding for Research and Innovation (Horizon 2020)” will focus on opportunities for Irish companies and will provide an overview of the European funding that is available for research and innovation. 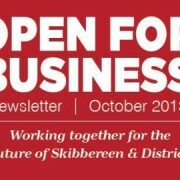 This encourages European companies to work together with particular emphasis on small and medium sized businesses and is a method by which local business can work with companies amongst our European neighbours and draw more money, business and skills into the Skibbereen and District area. Seán is a native of Drinagh and a past pupil of St. Fachtna’s, De La Salle in Skibbereen. He designs courses for research managers in Universities and Research Centres and since 1997 over 48,000 people have attended his courses in 29 countries. This will be a unique opportunity to attend a presentation on this subject by a leading European authority in West Cork. Tickets are only €20 and numbers are strictly limited. 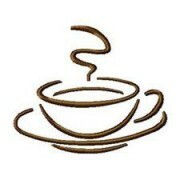 To register online please go to www.eventbrite.com and search for ‘European Funding Breakfast Briefing’. Further enquires can be made to Mary at chamber @skibbereen.ie or contact (086) 2388300. 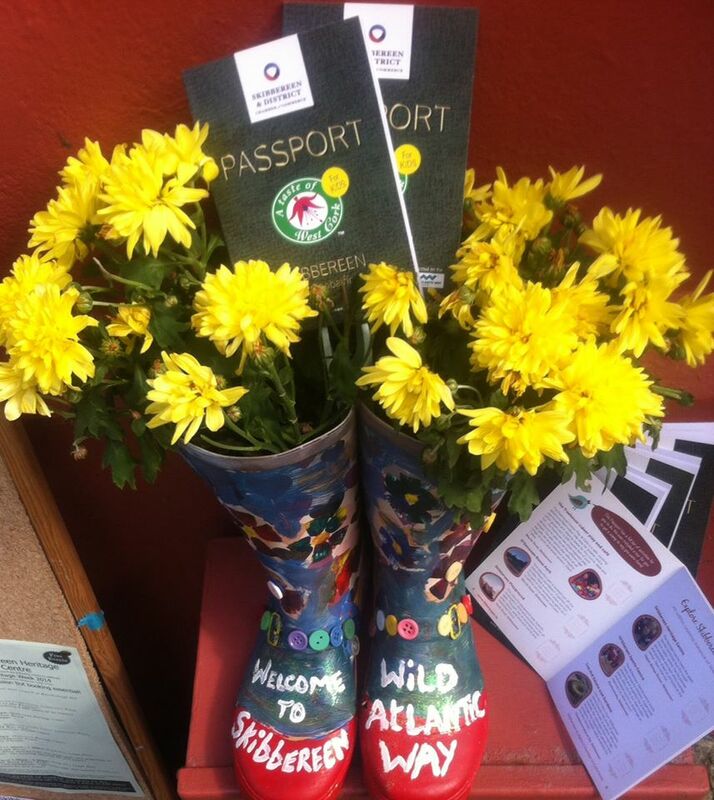 If you need something to do with the kids before they go back to school, or if you have family and friends visiting West Cork over the last few weeks of the season why not pop in to the tourist office for your free copy of the ‘West Cork Passport for Kids’? 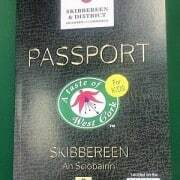 The Passports have a full list of things to do in Skibbereen and surrounding areas and you can even get your passport stamped when you visit different venues! The Passports also have pages for colouring, as well as information on beaches and places to visit. Pop into the Skibbereen Tourist Office for your copy (but be quick there are only a limited number of Passports left)! 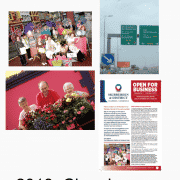 The Skibbereen & District Chamber of Commerce are celebrating the County Fleadh Cheoil coming to Skibbereen over the weekend May 8th – 11th, with their sponsorship of prizes for a “Shop Window Competition” in the town. This is your chance to get those creative juices flowing and show off the best of Skibbereen to our visitors and remember this is a great way to promote your own business too! Judging will take place over the Fleadh weekend. Cork South Ring road signage pointing the way to Skibb! The focus will be on ‘Creating a Winning Formula for Christmas 2013’ which will be delivered by James Burke. The format will be a presentation by James, followed by Q&A followed by free networking. 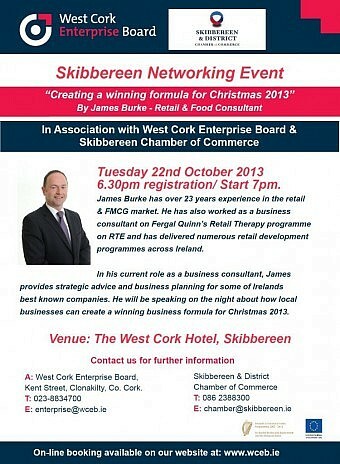 The event will be free and open to all businesses in West Cork. James Burke has over 23 years experience in the retail & FMCG market. 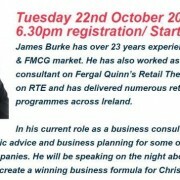 He has also worked as a business consultant on Feargal Quinn’s Retail Therapy programme on RTE and has delivered numerous retail development programmes across Ireland, inlcuding Skibbereen this year. 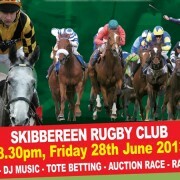 Join us for a ‘Night at the Races’, 8.30pm, 28th June. An opportunity for your business to be part of it! Your business is invited to the Rebel Passport Roadshow as part of the preparation for Cork’s flagship Gathering, Cork Rebel Week. This is your chance to be part of the hugely acclaimed Rebel Passport initiative. During the Roadshow you’ll be given information on how your business, whether individual retail unit, shopping centre, restaurant, bar, hotel or venue can easily become a Rebel Passport Partner. Being an official partner will not cost you anything, however it will provide you with the platform to market your business to a highly attractive audience of local, national and international Rebel-Passport holders. Don’t miss this opportunity to promote your business and be part of Cork Rebel Week. 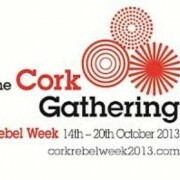 For further information on Cork Rebel Week, including the Rebel Passport, please email us to info@corkrebelweek2013.com. Funded and managed by the West Cork Enterprise Board. 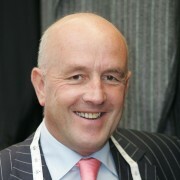 Retail guru James Burke will deliver the training programme on behalf of the Board along with visual merchandising expert Celine Cummins. The West Cork Enterprise Board ran this programme in both Clonakilty and Bandon in 2012 and both programmes were a huge success with fantastic feedback from retailers. With a growing demand and need for such training from retailers in Skibbereen, the Board has allocated funding to run a Skibbereen programme. Commencing in March, over a 4 month period, the intensive training programme will cover areas including: developing aggressive sales and growth strategies; strategic retail management; negotiation and developing world class customer service; visual merchandising and best display practice. Retailers will also receive an individual store audit and a visual merchandising audit. Speaking about the course, Michael Hanley, CEO, West Cork Enterprise Board said, “We are delighted to be recruiting for this programme in Skibbereen town. We realise the needs of independent retailers and we are glad to be able to assist them. Without our local independent retailers our West Cork towns would be very different places. Our objective in running this programme is to give a new outlook to retailers and provide them with new tools which they can implement at a relatively low cost to their business over the coming months”. Also speaking about the course, retail consultant James Burke said, “It was a great to work with the Bandon and Clonakilty retailers in 2012, which despite some tough times were still positive about their businesses. 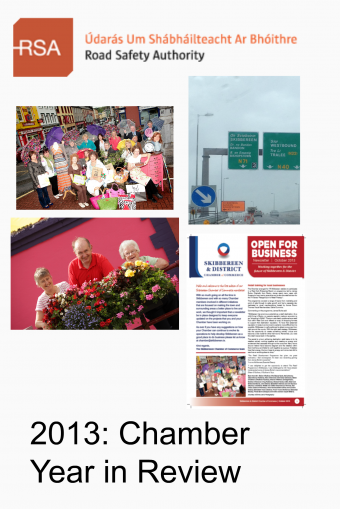 With overall retail sales in Ireland down by more than 4% for 2012 alone, it is imperative for retailers to plan ahead for their business in 2013. I am looking forward to working with the Skibbereen retailers and I am confident that each of them can increase their business by up to 5%, after partaking in the programme, by putting in to practice some effective techniques which they will learn on the programme”. Secretary of the Skibbereen Chamber of Commerce Maeve McCarthy commented: “This is a great opportunity for retailers to benefit from an industry leading expert. When you are operating in stringent times it is so easy to focus on day to day operations. By completing a training course like this , it gives one an opportunity to step back from your business and view it in a holistic manner to see what steps are necessary to increase business and ultimately profits. The Skibbereen Chamber would encourage all retailing members to consider applying for this course”. Recruitment is now taking place for what is anticipated to be a heavily subscribed course, interested applicants should complete an online application from the West Cork Enterprise Board’s website: www.wceb.ie or call 023-8834700. 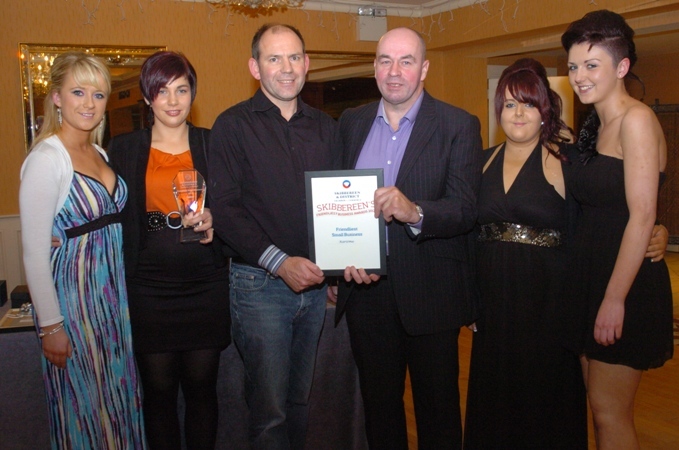 Friendly Business Awards 2012 – The Winners! 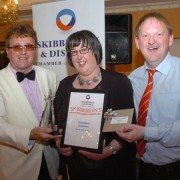 Here she is being presented with her prizes by last year’s winner Brendan O’Brien & John Collins, compere on the night. Award winners also included Karizma Hairdressers for Friendliest Small Business and Blackwater Motors for Friendliest Large Business. Steve Redmond accepted a special award on the night as Skibbereen’s most Famous Employee while his boss and owner of Skibbereen Tool Hire, Vincent Hurley was awarded Skibbereen’s most Accommodating Employer for allowing Steve so much time off to complete the Ocean’s Seven Challenge over the past three years! Thank you to everyone who supported the awards, the night was a great success, over 130 attended. A big thank you to all the nominees, their families, supporters & everyone who came along to enjoy the night, you all made it such a great evening. Thank you to John Collins, for making the room laugh all evening, Brian Hennessy’s band who had everyone up dancing and special guest Steve Redmond. Skibbereen’s Top 5 Friendliest Employees (photo) with compere for the awards night John Collins, Neil Grant & Martin O’Mahony Chamber Members. Best of luck to all nominees in all three categories! Tickets for the event are €8 and will be available at the door. Light refreshments will be served with live music to follow the awards. This promises to be a great night! 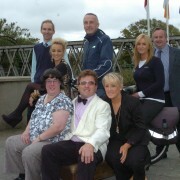 Friendliest Small Business: Hair Heaven, Cahalane’s Bar, Cleary’s Pharmacy, Karizma Hairdressers, Thornhills Electrical. 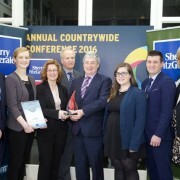 Friendliest Large Business: Drinagh Co-op, Skibbereen Credit Union, Blackwater Motors, Field’s SuperValu, The West Cork Hotel. Mystery shoppers will visit all shortlisted businesses over the coming week to decide the overall winner in each category and will be announced at the awards night on the 20th October, 8pm at the West Cork Hotel where Oceans Seven Champion Steve Redmond will address local business people on the importance of remaining positive in challenging times. 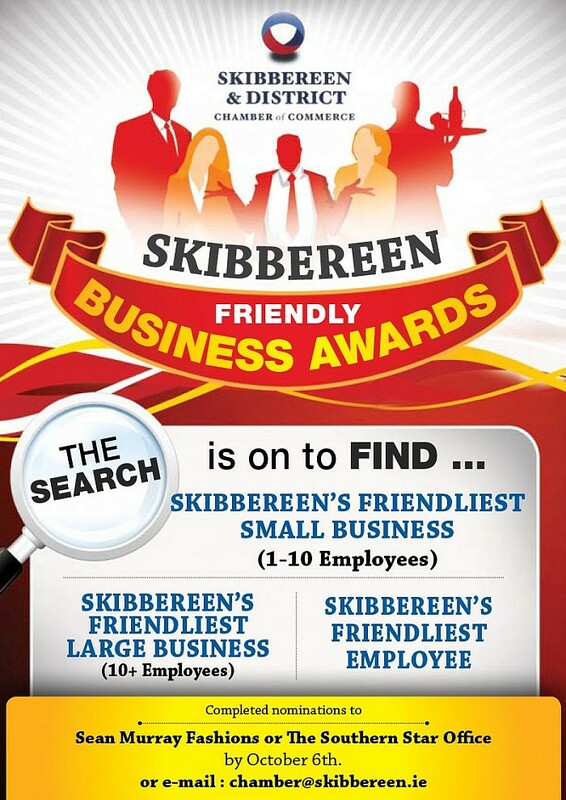 Skibbereen & District Chamber of Commerce are once again in search of the town’s friendliest businesses & employee. 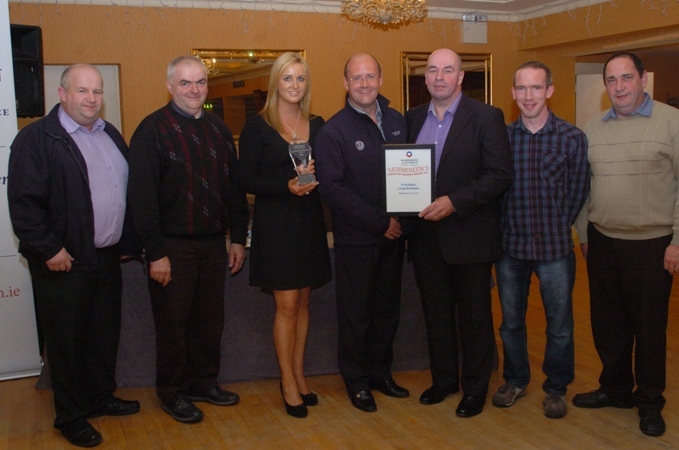 The awards will aim to copper fasten Skibbereen’s position as Ireland’s friendliest town. This year the Friendliest Business Award will be split into two categories, small (1-10 employees) & large (10 plus employees). Now is your chance to nominate the businesses you feel are friendly, welcoming & courteous & an employee who goes above & beyond the call of duty for customers. Closing date for nominations is Saturday 6th October, after which a group of mystery shoppers will visit the shortlisted businesses to decide the winners. Brendan O’Brien, who won the award last year for Skibbereen’s Friendliest employee, said he is looking forward to handing on his crown this year, ‘it has been great to hold the title for the past 12 months and I encourage everyone that shops in Skibbereen to vote for another deserving winner this October’. A shortlist of nominees will be announced before the event with the winners being crowned at the special ceremony in the West Cork Hotel on Saturday 20th October. To vote fill in the nomination form in this week’s Southern Star, nomination forms will also be available in businesses throughout the town over the coming weeks and can be returned to Sean Murray Fashions or the Southern Star Office, alternatively you can email your nomination to chamber@skibbereen.ie by 6th October. All members are welcome to an informal ‘coffee/tea break’ where you can meet, chat and network with new people from the Skibbereen & District Business Community in a relaxed setting. We would encourage as many people as possible to ‘take a break’ this Thursday and come along for half an hour or an hour – whatever suits best. Many thanks to those who attended last week’s Breakfast Briefing on how to use the internet to promote your business more effectively. 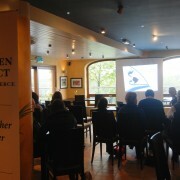 Thanks also to the Riverside Café for hosting the event and also to Granite Consulting for delivering the presentation. If anyone has any suggestions on topics they would like to see covered at a breakfast briefing please send an email. with Guest Speaker, Louis Copeland. 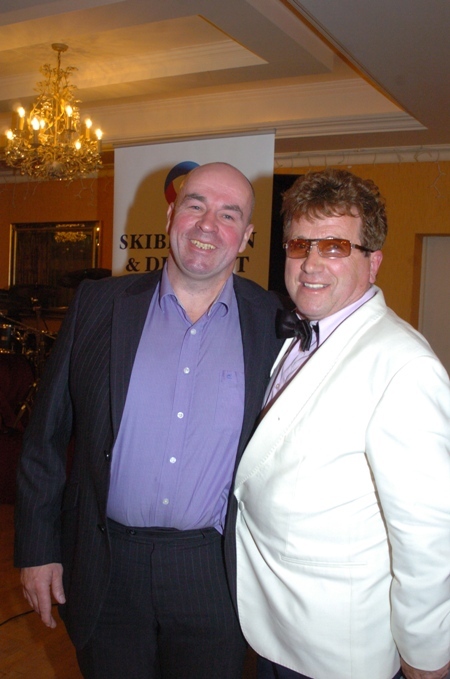 Skibbereen’s Friendliest Employee is Brendan O’Brien! UPDATE: Brendan O’Brien of Fields Supervalu is Skibbereen’s Friendliest Employee. Congratulations Brendan! Skibbereen Business Association has narrowed down the town’s friendliest employees to ten people who will battle it out on Saturday 15th October in The West Cork Hotel to take the special award. Almost one thousand nominations were received for more than 60 employees in the town. The ten employees with the highest number of nominations are; Rui Santos (Annie Mays), Kate Holland, Brendan O’Brien (Field’s SuperValu), Vitalija Bendziute (Pierce Hickey’s), Deirdre O’Donovan (Drinagh Co-Op), Marie O’Regan (Sean Murray’s), Joe Leahy (Hegarty’s Costcutter), Darren McSweeney (Tully’s Bookmakers), Bernice O’Shea (Skibbereen Medical Centre) and Mary Quinn (Cleary’s Pharmacy). Mystery shoppers have also visited all businesses in the town to decide the winners of the other categories, namely Best Overall Business, Friendliest Small Business, Friendliest Medium/Large Business and Best New Business. The awards will be held in The West Cork Hotel on Saturday October 15th at 8pm where Apprentice winner Steve Rayner will address local business people on customer service and building a better business. 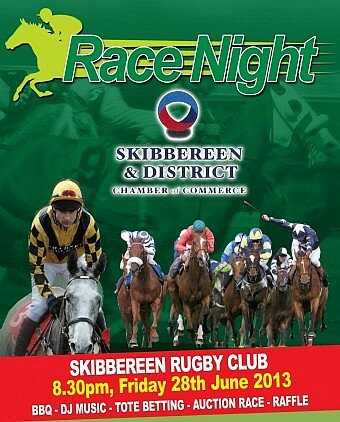 Tickets for the event are €15 and are available from Kalbo’s Café, North Street and Sean Murray’s, Main Street. Light refreshments will also be served with music by The Horny Devils.